In the interest of saving you money, the following list of moving tips has proven extremely helpful in reducing the amount of time and frustration spent on your moving day. Moving During The School Year? If you have kids, I’m sure you have dealt with the stress of the back to school fiasco. But, what about the hassle of having to move with young children during the school year? Unfortunately, not all moves are planned. Sometimes we have to hire an emergency moving service due to evictions, family emergencies, or other surprise situations. When short notice moves take place, your children may have to switch schools depending on whether you are moving locally or long distance. Clearly, mark the destination of each box on top and sides. Mark boxes containing glass, etc. as “FRAGILE”. PARKING: Reserve ample parking for the truck. If parking is to be on a city street, it is your obligation to tell us of any meters that need to be capped by the city. In the winter, be sure to have the parking area and walkways clear of snow and ice. CONTENTS OF DRAWERS: The contents of desk drawers must be emptied. Unless weight is too great, file cabinets can generally stay packed, however, the doors must be either locked or securely taped shut. Clothing may remain in drawers, but remove fragile items ( perfume, jewelry, etc.). CLEANLINESS: Please have all items to be moved in a clean condition. We need to keep our moving blankets and other moving equipment clean. Please provide mats at entrances for keeping the home clean. 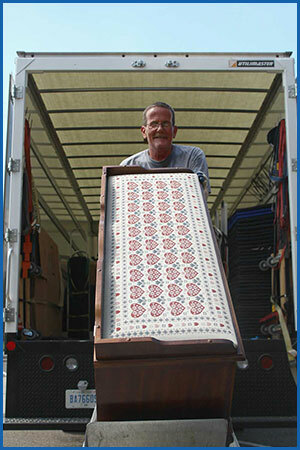 SAFETY: Our movers have the right to not move any dangerous items. We cannot transport flammable liquids. Be sure to empty gas from gas tanks, grills and lawnmowers. TOOLS: Have basic set of hand tools available so that our men can quickly disassemble an item if the need should arise. APPLIANCES: Please disconnect all appliances before the movers arrive. TIMESAVERS: These are some things that will help us provide yours with a LOWER final price. Move your own pictures, lamps and electronic equipment. Remove mirrors from the back of dressers and chests. Remove shelves from bookcases and china cabinets. You and your friends are welcome to help us bring items to the truck, but for insurance purposes, you will not be allowed to enter the truck itself. Tips are not necessary but are appreciated. Last of all, just RELAX! It will be over before you know it! If you are thinking about moving during the holiday season, make sure to contact Men on the Move. The holidays can be a stressful time. Do not let a pending move add to your stress level. The experts at Men on the Move can help your move go quick and smooth leaving you time to enjoy the holidays with your family. Just The Moving Tip Of The Iceberg! Of course, these are just some of the great moving tips and advice we have for you. If you have more questions about moving give us a call at (734) 744-9547. In addition, if you would like a free quote on your next move click here for a residential quote or click here for a commercial quote. You will be glad you did!